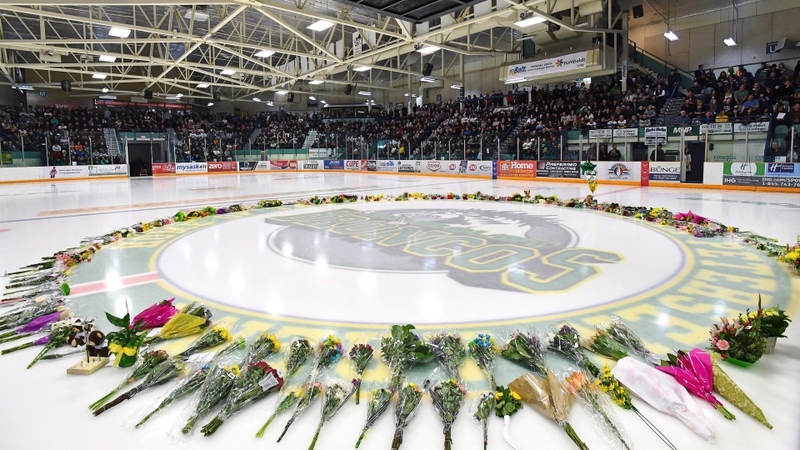 The GoFundMe page dedicated to the Humboldt Broncos, believed to be the largest of its kind in Canadian history, will remain open for two more days before being transferred to a newly created memorial fund, the team's officials announced Monday. Humboldt Broncos president Kevin Garinger announced at a news conference in Saskatoon that the campaign will remain open until midnight Wednesday, at which point all funds will be transferred to the new Humboldt Broncos Memorial Fund. The $12 million raised will serve its intended purpose of paying for expenses of the victims' families, Garinger said, adding that it's too soon to give a more specific breakdown of the way the funds will be allocated. "Sylvie was hoping to raise $5,000 to maybe buy coffee and support maybe parking, and that sort of thing, to help families," he said. "It of course grew much larger than that." Garinger also said the team will continue to accept donations through another new organization, the Humboldt Strong Community Foundation, which he said will "support Humboldt Broncos players, employees, families and volunteers, as well as first responders and emergency services personnel, teams, athletes, related organizations and communities affected by the crash." "The Broncos cannot and will not be able to verify the legitimacy of any other event, or the dispersal of funds raised by any other such events," he said. In recent days, concerns have been mounting about the sale of unauthorized merchandise that uses the team's name, logo, or the slogan "Humboldt Strong" without donating any of the funds to the victims or their families. "Knitting is so therapeutic that it kind of gave me a way to channel all those horrible feelings," she says. For one week, Savietto decided to donate $10 from the sale of one particular model of hat to the Humboldt Broncos' GoFundMe page. She sold about 30 hats in that week, putting the total amount raised close to $300. That's a lot for her small shop, she says, especially because April isn't typically a very busy time for people to buy winter hats. The majority of the Etsy shops offering Humboldt Broncos-themed merchandise, including many American ones, say they are donating large percentages of the proceeds, if not the entire cost of the item, to the hockey team's GoFundMe campaign. For Savietto, that's indicative of the approach of an independent retailer. "Almost everybody I've bought from on Etsy is a mom," she says. "It's not a big business. There are very few sellers on there that are able to stop their regular work." "I couldn't imagine just putting the name 'Humboldt' on it just to sell more things."